The works of Geoffrey Chaucer : comparedwith the former editions, and many valuable mss. out of which, three tales areadded which were never before printed / by John Urry, student of Christ-Church, Oxon. deceased ; together with a glossary, by a student of the same college. To the whole is prefixed the author's life, newly written, and a preface, giving an account of this edition. Although it has become known as the Urry Chaucer, after the initial editor John Urry, at least 5 men contributed to the final product. 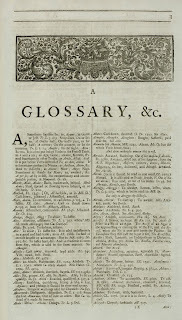 The work was left unfinished at Urry's death in 1715, and the final revision and completion were entrusted to Timothy Thomas who wrote the preface and glossary. Thomas was aided in this task by his brother William. The volume also contains a biography of Chaucer attributed to John Dart. Ref: The works of Geoffrey Chaucer, p. 1, 1721, Sir George Grey Special Collections, Auckland Libraries, 1721 CHAU. This edition of Chaucer’s works is notable for a few reasons. 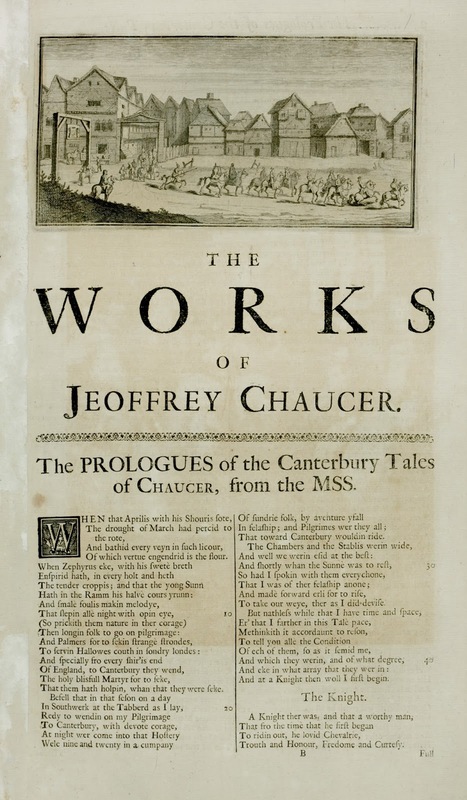 It was the first collected edition of Chaucer to be printed in roman type. Urry collected and compared as many existing manuscripts of Chaucer as he could find in his attempt to create a definitive text. Urry also attempted to regularise Chaucer’s metre and make the medieval text more comprehensible for contemporary readers. It contains many features that will be familiar to those who’ve read student’s editions of literature from previous centuries. 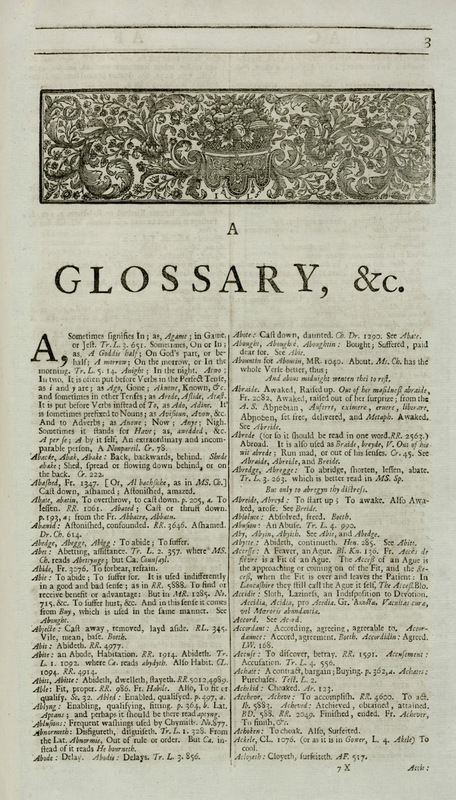 This is the first of the comprehensive 81 page glossary. Ref: The works of Geoffrey Chaucer, Glossary p. 3, 1721, Sir George Grey Special Collections, Auckland Libraries, 1721 CHAU. Readers in Georgian England looking back to the medieval period were presented similar difficulties as we face today reading texts from centuries ago. As Catherine Richardson notes in Chaucer: a beginner’s guide, “As English altered to become the language with which we are familiar today, Chaucer’s poetry began to sound at first old-fashioned and then just unintelligible (p.66)." 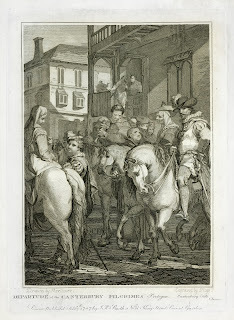 Urry’s attempts at making Chaucer more accessible were not entirely appreciated; under John Urry’s entry in the Oxford Dictionary of National Biography it states that, “the text of Urry's edition has often been criticized by subsequent editors for its frequent conjectural emendations, mainly to make it conform to his sense of Chaucer's metre.” It was not a great success at the time either, Alderson writes: “William Brome, as Urry’s executor, had received one-third of the copies printed by Lintot, and a plaintive letter from him to a London friend indicates that, twelve years after the publication of the edition, his copies still ‘lie upon hand’ (p.94)." However, as Alderson also notes, Urry’s text was to become the standard for a large part of Chaucer’s poetry from 1721 until 1810. Auckland Libraries’ members can read this biography with your library card. Other than a portrait of Urry signed by Nicolas Pigne, the illustrations in this edition have been attributed to George Vertue. 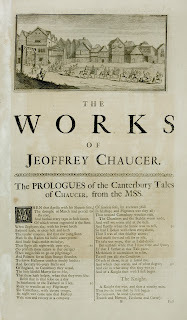 In this article in the Chaucer Review, Stephen R. Reimer provides evidence of this, as he found a collection of proofs of Vertue’s works which include a series of engravings identical to those that appear in Urry’s 1721 Chaucer as well as a note in Vertue’s hand which say they were completed in 1715 “For Chaucer’s Works.” Auckland Libraries’ members can also access the Chaucer Review using your library card. Ref: The works of Geoffrey Chaucer, Plate opposite p. 1, 1721, Sir George Grey Special Collections, Auckland Libraries, 1721 CHAU. Ref: The works of Geoffrey Chaucer, Plate opposite p.67, 1721, Sir George Grey Special Collections, Auckland Libraries, 1721 CHAU. Auckland Libraries also hold other rare volumes of Chaucer including Pynson’s 1492 edition, just drop into the Sir George Grey Special Collections reading room to have a look at them. 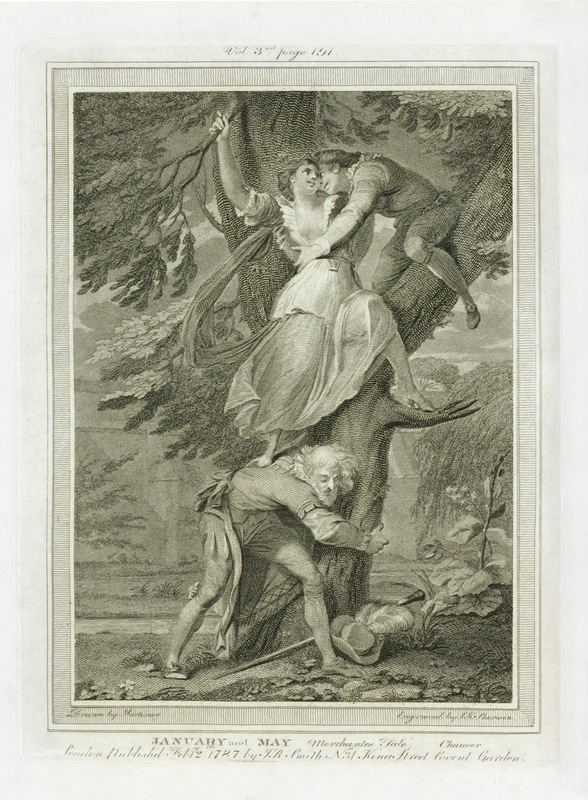 For more information on another extra-illustrated (grangerised) work that the library holds, take a look at this blog post on an extra-illustrated Edinburgh Folio Shakespeare.